Bowen’s disease, sometimes referred to as squamous cell carcinoma in situ, is a form of squamous cell carcinoma that appears as a red, scaly, and irregular plaque that slowly enlarges as the cancerous cells grow laterally. The phrase in situ means “in its original place” and is used to differentiate this form of cancer from invasive squamous cell carcinoma – a more serious form which carries a higher risk of metastasis. Bowen’s disease does not metastasize but a small percentage of these cancers will progress to the invasive form if left untreated. Squamous cell carcinoma in situ is confined to the epidermis – the transition to the invasive form occurs if the cancerous cells breach the dermis. 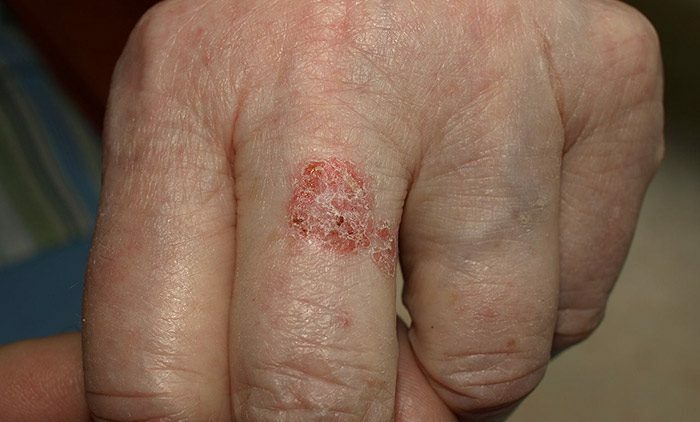 Bowen’s disease, as well as other forms of squamous cell carcinoma, basal cell carcinomas, and melanomas are all caused by sun damage and typically appear on the sun exposed areas of the body such as the arms, hands, legs, face, and scalp. It most often appears on the lower legs on women and on the face/scalp on men. UV radiation found in sunlight damages DNA found in skin cells, leading to mutations. It is the accumulation of these mutations over a lifetime of sun exposure that leads to the formation of Bowen’s disease and other skin cancers. Its incidence is higher in populations with fair skin, hair, and eyes, and is more likely to appear in immunosuppressed individuals. Fortunately, the prognosis for individuals afflicted with this disease is quite good! Many treatment options are available. Surgical excision and electrodessication and curettage can be used to remove plaque but leave a linear or circular scar, respectively. Cryotherapy can be used to freeze the cancerous cells but usually leaves a hypopigmented mark. Fluorouracil and imiquimod are effective topical treatments. Other treatments such as topical and oral retinoids, chemical peels, and laser ablation have been used successfully but are not widely used. In some instances this disease can safely be left untreated in elderly persons, though this is uncommon and should not be expected. Contact your dermatologist if you begin to exhibit symptoms of Bowen’s disease or any skin cancer for evaluation and treatment.